Learner drivers are now allowed to take motorway driving lessons with an approved driving instructor after a change in the law. The move is aimed to help ensure more drivers know how to use motorways safely. Before the change, newly qualified drivers could hit their nearest M-road as soon as they had received their licence. Safety groups have long held concerns that the speed and size of motorways were very different to the types of small local roads they would be used to and this inexperience could lead to accidents. 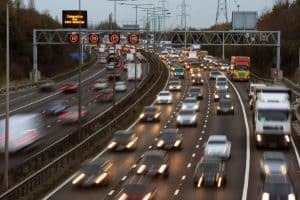 In the past, learners could only take motorway lessons after they had passed their driving test, with some newly qualified drivers able to take lessons through the voluntary Pass Plus scheme. improve their confidence to drive on the motorway unsupervised after passing their driving test. Not every motorist needs to use a motorway; in fact, some drivers have still never been on one. As such, the Driver and Vehicle Standards Agency (DVSA) won’t force new drivers to take motorway lessons, recognising that some people don’t live close enough to one for it to be worthwhile. However, the authority stresses these lessons would be a good opportunity to further develop the skills and experience of new motorists before driving on their own. Motorways account for a fifth of all UK traffic, but they’re not the most used road type – that honour lies with rural A roads (29 per cent). Any lessons taken on a motorway must be overseen by a DVSA-approved driving instructor, so you shouldn’t see any motorway lessons led by friends or family. Drivers can verify that their driving instructor is DVSA-approved by checking that they have a green DVSA badge, which is usually displayed in their vehicle’s windscreen. Alternatively, learners can find an approved driving instructor using Gov.uk’s ‘Find driving lessons, schools and instructors’ service. Learner drivers on a motorway will also have to be driving a car fitted with dual controls. Learner motorcyclists won’t be allowed on motorways. As with normal learner drivers, experienced motorists should be patient with their motorway counterparts. They may not be so skilful at anticipating and responding to events. Motorway learner drivers will still need to display L plates, but it’ll be down to individual driving instructors whether they want to use a driving school rooftop box during motorway lessons.